Music Director : Shamir Tandon, Sharib Sabri and Toshi Sabri. Vocals : Sonu Kakkar, Lata Mangeshkar, Sharib Sabri, Toshi Sabri and Neil Nitin Mukesh. Lyrics : Ajay Garg, A.M. Turaz, Sandeep Nath and Kumaar. After the success of Fashion, Madhur Bhandarkar is back to give us his latest venture: Jail. 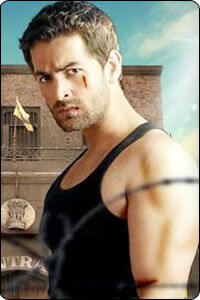 The movie starring Neil Nitin Mukesh and Mughda Ghodse is expected to be released in November. Along with the Sabri brothers Shamir Tandon has also composed music for this movie. There are 8 tracks, 4 original and 4 remix versions. Of the duo music composers, one of the brothers Toshi Sabri himself has sung the song. The song begins with a good pace on the guitar and the tempo continues through out the song. Although the number sounds more like pop it will surely be a hit because the beats are quite catchy. Sharib Sabri. The song has been soulfully rendered. Sharib has given a soul and emotion to the song. The guitar in the background soothes your mind. The arrangements are quite good. And the lyrics are also impressive. This song will surely burn the charts. This song is composed by Shamir Tandon. It is an item number that has been sung by Sonu Kakkar. A song for the masses with a mix of western and typically Hindi movie music. There are hardly any lyrics, just repetition of Bareily Ke Bazaar Mein. So it gets a little irritating after listening to the song for a few minutes. This song has been sing by Lataji. Although the song and tune reminds you of 'Ek tu hi Barosa' of 'Pukar', the song is not half as good. The voice selection is almost perfect and the lyrics are also good. However Lata Mangeshkar has been wasted in the song. The music directors could have had an all time hit with her in their hands but somehow they didn’t capitalize on the talent of their singer. What a waste of potential and opportunity! The remix version of Sainya Ve begins with a bang. The beats are good making you want to tap your feet. This version surely beats the original version too. It is more of the rock music kinds and hence surely this version would be more famous with youngsters than the original. Yet another remix version but this is more towards just remix. The pace of the song has been increased along with the beats. One would wonder if there was a necessity to have this version. There is surely nothing special or different from the other versions. The rock version is way above this one. This is another remix version – just a little fast from the original version. Only the voices have been equalized and processed with a little bit of English lyrics thrown around here and there. May be it is a little better than the original version. But here too the repetition of words is highly irritating. The effort was meant to be contemporary but there was hardly any difference between the original and this version. A song that was meant to be a prayer but sounds like a sad song. Yet again waste of Lataji. Madhur Bhandarkar's movies are very strong in the screenplay, concept, story and hence there is no necessity to concentrate on the music as much. It surely does not add to the movie’s success. So the songs are only for diversion or to provide relief. So what was the necessity to have four remix versions when the originals were not so great themselves? The only interesting song was Milke Yun Laga and secondly the rock version of Sainya Ve.